Thank you so much for all of the birthday wishes! You guys are the best of the best. Turns out, I went through days of healthy, carb-conscious eating for naught, since an unexpected snowstorm hit last Thursday, forcing Daddy and I to postpone the fancy birthday feast. Good decision, since there were quite a few road closures in Daddy’s neck of the woods. He was pretty upset about it, but the way I see it, better to wait than risk having things ruined by a traffic accident or worse. I’ll take my father in one piece, thank you very much. Besides, now I have something to look forward to in March–and it can be a LONG slog through March in these parts. I’m especially wary because February was warm and mild here, so I’m betting Mother Nature has some assholery tricks up her sleeve for March. Hubs and I had a fun, whirlwind weekend in Las Vegas. We ate well, sipped a few craft cocktails, took in a concert, lost some sleep and lost some money at blackjack (my fault, mainly–I have the worst luck at the tables. Always have. Have you ever seen the movie “The Cooler” with William H. Macy? That’s me. Cooler Extraordinaire). Not a bad way to spend a couple of days, although I must say, I’m getting a little long in the tooth to survive on five hour’s sleep a night. 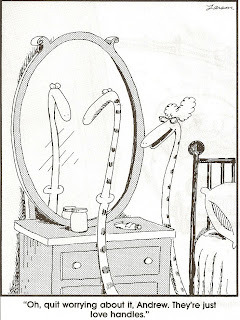 Like, WAY long in the tooth. It took me days to recover. Maybe our next vacation should be one of those geriatric cruise trips to Alaska? Actually, our next vacation is to Cabo San Lucas for spring break, which my husband and I realized is only a few weeks away. Spring break = warm vacation weather = swimsuit. Visualization of self in swimsuit = monumental freakout. Monumental freakout = return of Le Regime. Yes, it’s that time of year at the House of T. As soon as our plane landed back in Colorado, I got to meal planning and making grocery lists. Goodbye, craft cocktails and Kobe beef sliders! Hello, egg white frittatas and black bean chili! Hey, it can’t be just us. Everyone weathers winter with a little extra padding, right? That’s how I think of it…it’s not fat, it’s friendly insulation. One of the first things on the menu was this healthier version of eggplant parmesan that popped up on my Facebook feed via Tasty.com. Their recipes are always quick, easy and delicious-looking, but not all of them are healthy. And let’s not lie to ourselves here–there’s cheese in this recipe so it’s not uber-dietetic but hey, baby steps, people! One can’t go directly from Kobe beef sliders to vegan kale and chia seed smoothies. At least I can’t, anyways. Let’s ease ourselves into this Regime thingy, shall we? I don’t want us to go into shock straight out of the gate. 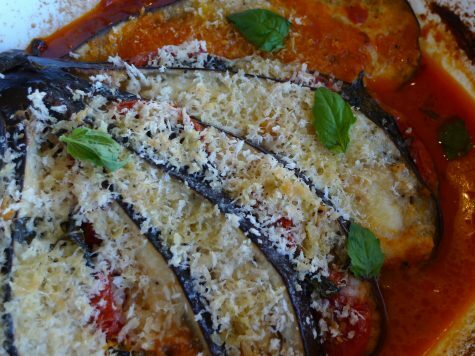 This recipe is pretty straightforward, and it’s so much easier than regular eggplant parmesan because there’s no need to salt the eggplant, or bread the eggplant (flour, egg, breadcrumbs) or fry the eggplant. 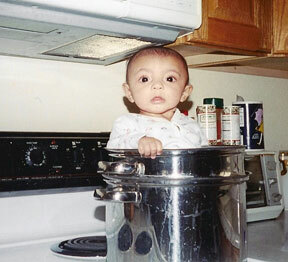 Hence, it’s a lot better for you and so much easier in the kitchen cleanup department. My only moment of confusion came regarding the mozzarella cheese called for in the recipe. They didn’t state whether you used fresh mozzarella or the regular sliced mozzarella that you throw in your lunchtime sandwich. I scratched my head a little and then decided to use fresh mozzarella, because fresh is always better, right? Actually, I think maybe regular mozzarella would be better in this recipe. My eggplant parm was still really delicious, but the fresh mozzarella kind of melted into the sauce instead of staying nestled in between the slices of eggplant. The result was a less-cheesy dish, and I think most people want cheesy. Other than that (and the inclusion of crushed red pepper flakes for a little heat), I wouldn’t modify this at all, unless you want even more cheese, and if you do, just be more generous with the grated parmesan on top of the finished dish. 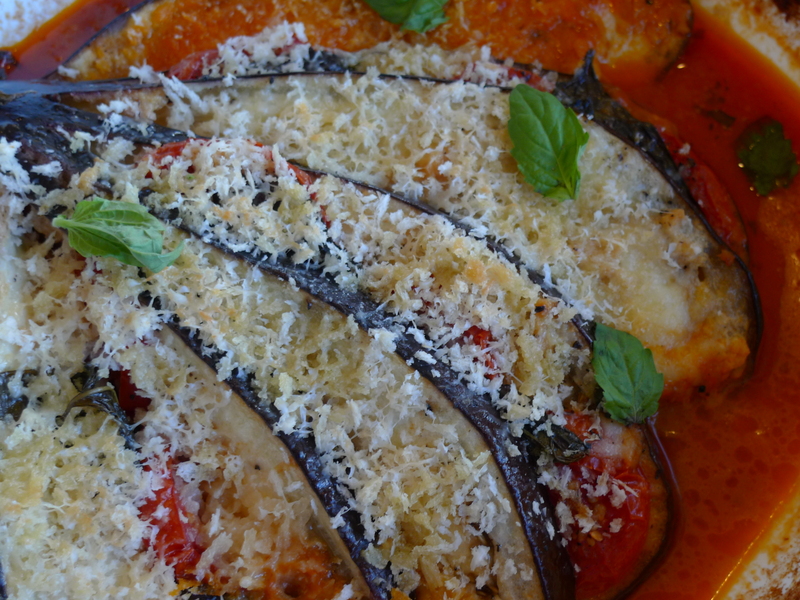 My husband and I really enjoyed this recipe, and that’s saying something, because he’s not a huge fan of eggplant. If you’re trying to lighten things up around your house, or if you’ve pledged alliance to Meatless Mondays, or if you just want a healthier dinner option, give this one a try. More Le Regime recipes to follow, readers! Come on, you know you’re excited. Keep the stem of the eggplant intact. 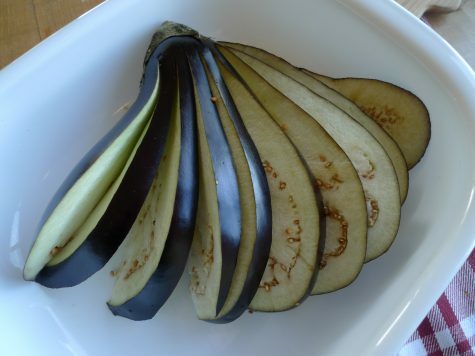 Slice the eggplant lengthwise into thin (about 1/3- 1/4-inch) strips, cutting up to the stem but not through it. Spread the bottom of a baking dish with marinara sauce. Fan the eggplant out on top of the marinara. Alternating layers, stuff one slice with tomato slices and next slice with mozzarella and basil leaves. 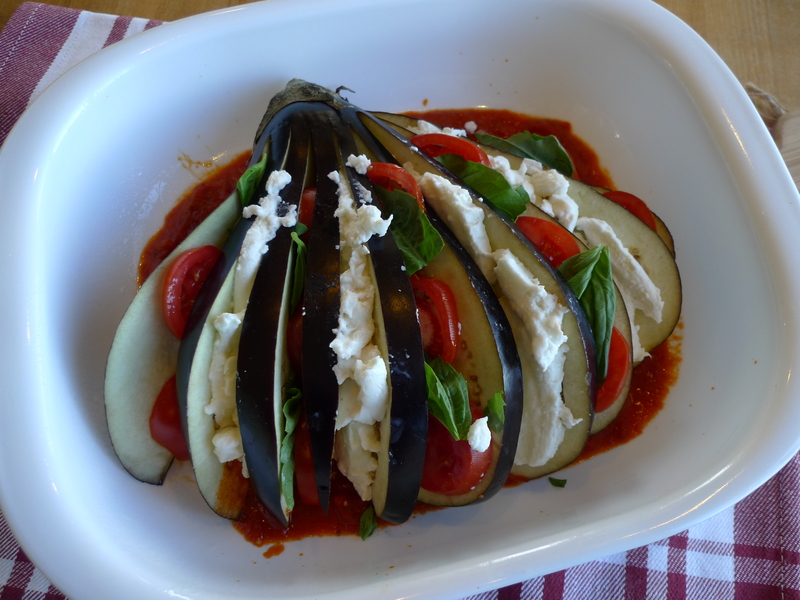 Repeat layers until eggplant is stuffed. Sprinkle salt and pepper over eggplant and sprinkle with chopped garlic. Drizzle eggplant with extra-virgin olive oil. Cover baking dish with foil and bake for 50 minutes. In a small bowl, combine panko, Parmesan, and remaining salt and pepper. 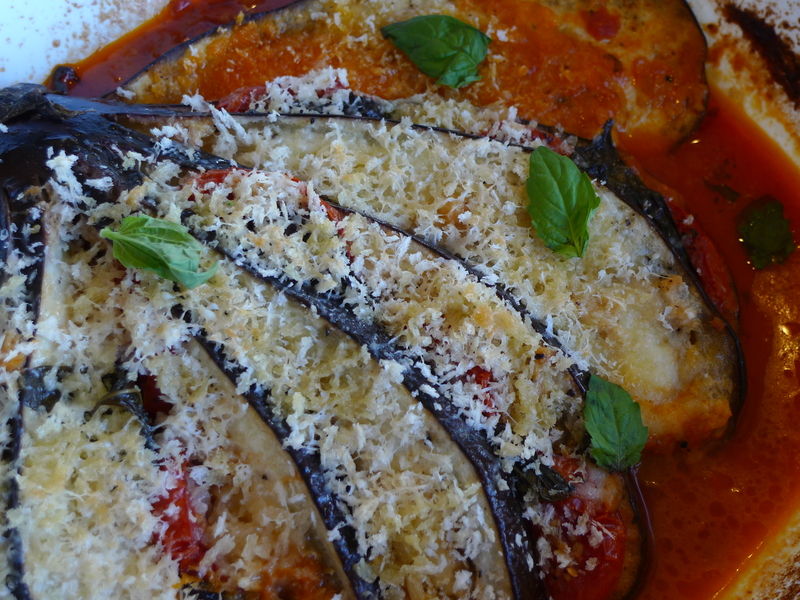 Uncover the eggplant, top with panko mixture and bake an additional 5 minutes or until browned and bubbly. Serve with extra marinara sauce, if desired. Sigh. I wish I liked eggplant. This idea looks really quite genius. Looks delicious. I’m in. Rao’s IS good if you’re going for had. We like them. Hasselback always makes me think of David Hasselhoff. Because I’m Baywatch years old. This is making me wish I liked eggplant too because it does look pretty genius.